It frequently occurs in men between 20 and 40 years of age and usually only affects one side of the body. There is no single identifiable cause of Kienböck’s disease but there are several associations. These include skeletal variations in forearm bone length and lunate blood supply, trauma and underlying disease such as sickle cell anaemia and lupus. Wrist movements that cause extra compression of the lunate may also lead to the disease. Since the lunate articulates with the forearm bones at the wrist, symptoms relate to pain and stiffness whilst attempting to move the wrist. Initially patients often feel they have sprained their wrist. When examined tenderness is noted over the lunate bone, with some swelling and decreased grip strength. Following a history and examination of the affected hand and wrist, x-rays of the wrist will be taken. Should the diagnosis remain in doubt or further information is needed an MRI scan can help. What is the natural course of the disease? Kienböck’s disease is divided into 4 main stages. Patients may experience a variable progression through the stages but in most cases the progression is slow. In Stage 1 there is mild to moderate pain and x-rays are usually normal but may indicate a fracture in the lunate. In Stage 2 the pain worsens and swelling may be noticeable. The lunate begins to die at this stage due to an interrupted blood supply and appears white (sclerotic) on x-rays. At Stage 3 movement at the wrist becomes increasingly difficult due to stiffness and pain, and some patients lose grip strength. The lunate is now collapsing and breaking into smaller fragments leading to slight rearrangements in the positioning of the surrounding wrist bones. Finally at Stage 4 there is increased pain, stiffness and swelling to the wrist joint due to the degeneration of the bone surfaces adjacent to the lunate. 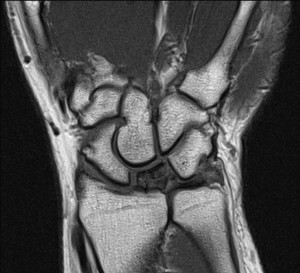 X-rays demonstrate an irregular white outline to the neighbouring wrist bones representative of osteoarthritis. Treatment is decided on a case-by-case basis after consideration of the patient’s symptoms, background and the stage of the disease. In the early stages simple painkillers such as paracetamol and anti-inflammatory medications may help relieve the pain and swelling. Splinting the wrist and avoidance of certain wrist movements can reduce the amount of stress placed on the lunate. If symptoms fail to improve or progress past the earliest stages then surgical treatment may be considered. The aims of surgical treatment are to either improve blood supply or relieve pressure to the lunate. There are a number of surgical options, which will be considered on a case-by-case basis. Forearm bone length adjustment can reduce the pressure applied to the lunate by shortening or lengthening the forearm bones. Joint fusion (wrist arthrodesis) involves uniting some or all of the wrist bones to make one solid bone, reducing pressure to the lunate. Wrist movements will be reduced at the expense of attempting to relieve symptoms. This procedure is performed on moderate to severe cases of Kienböck’s. Proximal row carpectomy is performed in severe cases where the lunate has disintegrated. The lunate and its surrounding bones are removed. Following the procedure there is still some wrist movement possible. Mr. Naqui performs Kienböck’s disease surgery at a number of hospitals around Manchester (see Hospitals page). The surgery usually can last between 1 to 2 hours dependent on the procedure and is a day case procedure requiring regional or general anaesthetic (see FAQs page). The type and size of scar depends upon the surgical option selected. Delicate stitches are usually used to close the wound. A dressing and cast will be placed over the wound, which will be removed at 4 to 6 weeks, dependent on the type of procedure. The stitches will be removed at 10-14 days after the operation either at your GP or at the hand clinic. You will be seen by Mr. Naqui 1 to 2 weeks after surgery. X-rays may be repeated from time to time to monitor the healing process. Mr. Naqui and the hand therapist will provide you with specific exercises to perform after surgery to regain normal wrist movements. A splint should be worn for 4 -6 weeks after surgery. Whilst the bone is healing you will be wearing a cast or splint for up to 6 weeks. During this period it is essential that you do not engage in any heavy lifting or strenuous manual work involving your hands. It is also recommended that contact sports and situations that may involve a risk of falling onto your hand be avoided. Despite surgery the disease may progress with development of arthritis at the wrist. Further operations may be needed to control symptoms and limit the rate of disease progression. All operations carry risk of post-operative pain and stiffness, infection and nerve injury. Mr. Naqui will discuss each of these risks with you in greater detail during your consultation.